(Bloomberg) -- The best of this year’s epic U.S. equity rally is probably over after concerted efforts from central banks around the world to stimulate growth peaked in March, according to Bank of America. 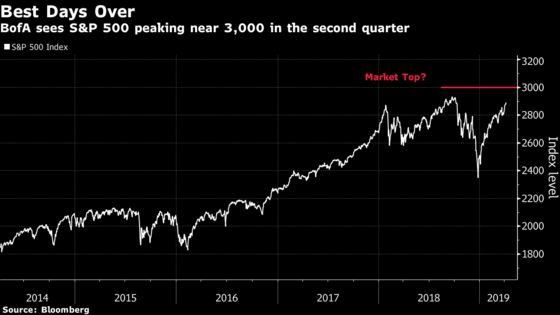 The S&P 500 Index will top out above 3,000 in the second quarter before faltering, strategists led by Michael Hartnett wrote in a note to clients on Friday. That’s about 4 percent above the benchmark’s current level and stands 100 points above the bank’s year-end target. While almost all financial assets have advanced in 2019, the S&P 500’s 15 percent surge has been the clear standout. The global rebound has come as the Federal Reserve signals that it won’t raise interest rates for a while -- if at all -- this year, and the European Central Bank lines up fresh stimulus in the form of bank loans. In March, 10-year Treasury yields fell to a 15-month low just days before White House chief economic adviser Larry Kudlow called on the Fed to “immediately” cut interest rates by a half percentage-point. All this suggests to Hartnett’s team that liquidity, a key force driving gains in riskier assets such as stocks, has reached a climax. Bank of America isn’t the only bank that sees the S&P 500’s fast rebound from last year’s carnage as having exhausted much of its upside. A little more than three months into 2019, the index has already surpassed the year-end targets set by seven of the 25 Wall Street strategists tracked by Bloomberg. While warning about a potential top, Hartnett said it’s still too early to bail out of stocks because sentiment hasn’t reached extremes that typically signal an imminent drop. Despite the equity rally, investors have been pulling money out of U.S. equity funds, with total outflows approaching $40 billion this year, BofA data showed. Among the firm’s five indicators for market timing signals, four flagged neutral readings. The strategists attribute the latest rally to two types of buyers: companies themselves snapping up $270 billion of shares through buybacks and traders making bullish bets with options. Investors should buy energy and financial shares to gear up for the final phase of the rally, they recommended.